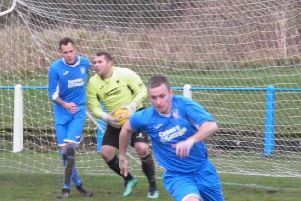 Lesmahagow Juniors gaffer Robert Irving insists he is NOT annoyed at his free flowing side being unable to make any headway against league leaders Lanark United, writes Craig Goldthorp. Goals by Sandy Thomson (penalty), John McStay (2), Kyle Weir (2), Steven Clark, Kris Jarvie and Scott Schoneville eased ’Gow to a thumping 8-2 home League Two success over Saltcoats Victoria on Saturday. Schoneville was man of the match and Weir’s second goal was exceptional. But the second placed Craighead Park men remain eight points behind Lanark with two games in hand. Irving told the Carluke and Lanark Gazette: “Lanark keeping winning is not annoying us at the ’Gow. “I take my hat off to Lanark for doing what they are doing. “It is not easy to come from behind and win and Lanark are showing steely determination to get results. “We need to keep winning to try and peg them back but we are running out of games. “I fully expect Lanark to get 12 points from their remaining games. I will take my hat off to them if they go to the end of the season undefeated. ’Gow visit Muirkirk in the league this Saturday, KO 2pm.